A social media storm greeted changes to the way Checkatrade is run, following a takeover from HomeServe owner Richard Harpin, so Installer headed to the West Sussex HQ, to get your questions answered. 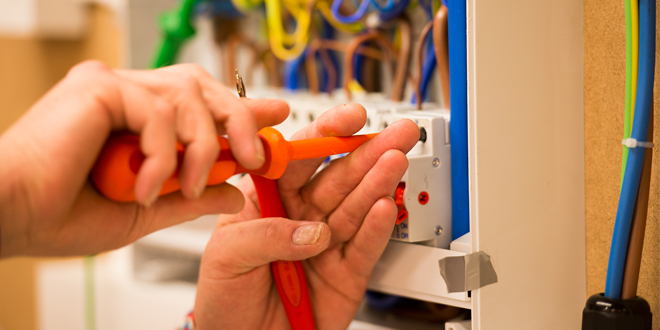 Securing new work is a top priority for all tradespeople. A lot of our readers own or work for local businesses, and there’s nothing worse than waiting for the phone to ring. That’s why trade directories and other lead generation sites are so popular, as they provide a steady supply of work. Checkatrade is one of the big hitters in our industry, so when it announced new plans, it’s no surprise it caused a stir. As news broke of changes, Installer joined a Facebook group set up by concerned members. One of the main questions was why a very successful businessman with an established company in the heating industry, wanted to buy Checkatrade? “I started with an idea for a heating and plumbing business called Fast Fix in Newcastle upon Tyne,” explained Mr Harpin. “I was running a property letting business and found it was really difficult to get reliable tradespeople to solve problems late at night. “I thought, ‘there must be a better way’, so I set up Fast Fix in 1992 and that was how HomeServe was born. Since then it’s grown into an international business with 8.4 million members. “Our business model is to offer annual home assistance cover. It gets rid of the threat of rogue tradespeople and big repair bills. If a customer has a blocked drain or burst pipe, we send an engineer to fix it, and pay the bill. “Our research shows that appeals to about 30% of UK householders. There’s another 50% that want to use a local tradesperson because they live close by, and they’ll be cheaper. “So we looked at where those 50% of people go if they want to find a local tradesperson, and found more people go to Checkatrade than Google. “So we ran some focus groups and discovered members were very happy with the amount of work they were getting. They paid a flat fee upfront and got a listing on the Checkatrade website, and customers called them. “We then spoke to homeowners who use Checkatrade and they said it was great. It’s an open directory where they can put in their postcode, read the reviews and decide who they want to call. We found more homeowners prefer this model. “So I met founder Kevin Byrne and it was clear we shared a common vision. 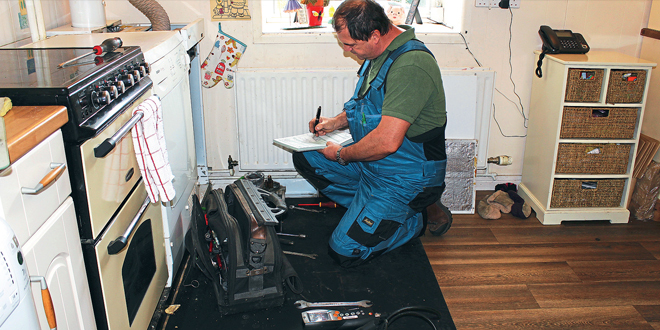 Stamping out rogue tradespeople and unfair repair bills. “Kevin set up Checkatrade in Selsey when there was a tornado over 20 years ago that ripped through all the homes. There was an influx of rogue tradespeople offering poor service. He thought, if he could put great tradespeople online, and have a local printed directory, it would be better. “He invented the 15 checks, including the face-to-face meeting, that tradespeople had to go through to be listed on Checkatrade, and we still use those today. “I thought this was a great model. I’ve been fortunate to grow HomeServe into a successful business in the last 25 years and I want to help tradespeople do the same. “This is about the bigger majority of homeowners. If they want a bathroom and kitchen fitted, that’s work that HomeServe would never do because it’s an emergency repair company. “So in December 2016 we bought 40% of Checkatrade and we liked it so much, we bought the rest of it in November last year. As both businesses operate in the heating and plumbing market, some of our readers questioned the relationship. We asked is there a conflict of interest? “HomeServe owns Checkatrade but they’re run as two separate businesses. This isn’t about taking work from Checkatrade and passing it to HomeServe. “We want HomeServe’s members to use Checkatrade. They have a solution for emergencies, but may need a local tradesperson for a new bathroom or extension. It is another way Checkatrade members can benefit from their membership, and has driven a large number of calls their way. For business owners, the cost of lead generation providers is critical. It has to make commercial sense for the tradesperson to get enough work to justify the price they pay. The Checkatrade prices are going up, so how do they calculate their prices? “We want tradespeople to pay a fair price. Originally it was £720 a year, and you had to pay it all upfront. “We thought that was quite a lot to pay in one hit, so why don’t we let people pay monthly, by direct debit, which they can now do. “Secondly we thought we’d make it fair, and charge according to the amount of work they’re getting. I was meeting tradespeople who were making £250,000-a-year through Checkatrade, and still only paying £720 a year. “Yet someone who’s a one-man band, just establishing a business, was paying the same. “So we decided to charge by the number of impressions that customers make on someone’s Checkatrade profile page. That’s a proxy for how much work they’re getting. “Then we looked at the trade category they’re in. If you’re a builder, the average job value is £9,000, if you’re a carpet cleaner it’s £150. So an impression is worth a lot more to a builder than a carpet cleaner. “We came up with a numerical value which was the number of impressions multiplied by the value of the category, to put each trade into a pricing bucket: £69.99, £79.99, £89.99 or £99.99 a-month plus VAT. “For heating and plumbing engineers, it will depend on the size of the business, and the amount of work they’re getting. “I met a guy who joined Checkatrade six months ago and he said he chose to pay the fee upfront and got his money back in the first month through two boiler installs. “So we have established fair pricing, and we’ve also put the prices up from £60-a-month to the new pay bracket that’s dependent on work. That still only represents between 0.8% and 1.6% of the estimated value of the work our members get. If you compare that to other businesses who charge 15% or 20% of the job value, ours is much fairer. “The extra membership fees are going directly back into consumer marketing and advertising. We’ve upped the budget from £5m to £15m this year. “Now we couldn’t have done that ourselves, that’s the reason we’ve put the prices up. We’re on Good Morning Britain sponsoring the weather, we sponsor the darts and we sponsor the Checkatrade Trophy for the football league. One new Checkatrade feature is called “Managed Contacts”, which is a way the company can track how many calls a member is getting. However, some installers were concerned because it meant their actual phone number wouldn’t appear on their profile, instead it would be a bespoke, trackable number. So what was the thinking behind it? “We tested this in the Midlands and it was successful. It shows that on average our members get 28 calls a month from Checkatrade. “We buy a local phone number (0121 for Birmingham for example), a mobile number and an email for every one of the trades in that test area, and those calls are diverted to them. “This isn’t us taking the calls, it still goes direct to the tradesperson, but the real benefit is we know the number of contacts they’re getting as a result of Checkatrade, so they can see the return on their investment. “Quite often a trade won’t know if a customer is calling because of our marketing or their own local marketing, so now we can tell them. It also lets us remove spam calls. “If you’re an existing member and you don’t see this as a benefit, you can opt out. What happens then is you would be put into the £99.99-a-month pay bracket. If you’re already in that category, there’s no additional price. If you are in a lower one, your price will go up. “We’ve seen a few members call and say they want to optout, but the vast majority are happy because they’re able to see the amount of contacts they’re getting. Customer reviews are a great tool for tradespeople. It’s worked for decades through word of mouth, and now online customers can choose tradespeople based on feedback. But who owns that feedback, and what happens to it if a tradesperson wants to leave Checkatrade? “We own it but we’re more than happy for members to use it on their vans, in their marketing material and encourage them to use it on their websites and link to Checkatrade, so customers can see all their reviews. It’s a very interesting time for the industry, with large technology-based companies entering the market looking to “disrupt” how things are done. So what’s the ideal future scenario for Checkatrade and its localtradesperson members? “This is a partnership with tradespeople. We don’t want big tech companies putting tradespeople out of business like they have with independent shopkeepers. “We’re introducing a members’ panel and inviting people from across the UK to act as a nonexecutive board of directors. “We’re taking nominations, making sure it’s a mix of trades and people from different parts of the country. So if we want to introduce a new idea, we can get feedback. Or if a member has an idea, we can see what people think. “We’re disappointing some of the 15million homeowners that come to the Checkatrade website, because outside of the South of England, we don’t have enough trades. “So in Hampshire, West Sussex, and Surrey for example, we have one Checkatrade tradesperson for every 250 homes. Where I live in Yorkshire, there’s one for every 11,000 homes. That’s not enough, so we’re trying to recruit more tradespeople. “We’ve also introduced our new buying club, to save members between £50 and £100-a-month on fuel, a new van, public liability, tools, materials etc. We’re using our buying power to bring added value to members. “We’re also introducing software to help tradespeople run their business more efficiently, with better looking estimates and better scheduling. This month we’ll be launching software completely free for members that’s not available to anyone else.